This is the bag I never knew I needed but now can't live without. 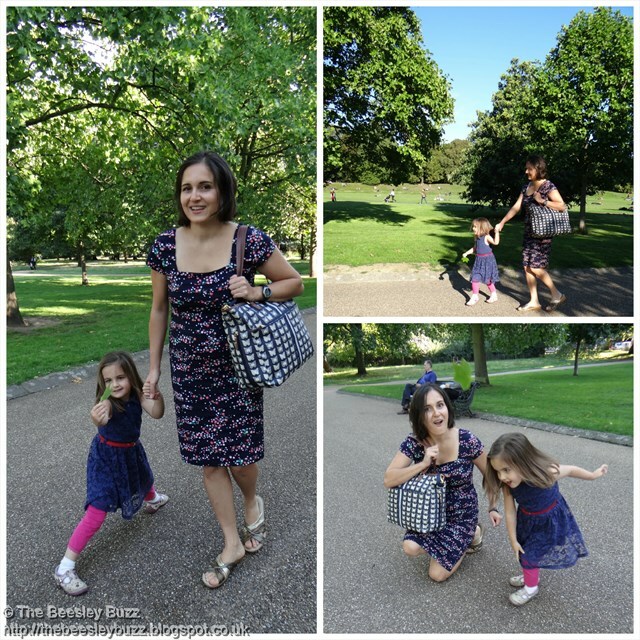 As the proud owner of an existing Yummy Mummy Pink Lining bag and a Notting Hill tote from Pink Lining, which are both such perfect bags, I wasn't sure exactly what would be different about the new Henrietta tote from Pink Lining. Pink Lining know what they are doing when it comes to changing bags as they seem to have thought through every little detail that mums need and then add oodles of style in the form of desirable 'must-have' prints et voila, perfect changing bags that everyone wants! The large zipped pocket on the front of the bag with a perfect little phone-sized pocket, a key ring hoop, a mirror and a pen clip proving handy. This pocket makes a great mummy's zone for the bag and would easily fit a purse and keys etc. The buggy clips enabling the Henrietta to hang on the handles or bars of a buggy - Invaluable for being able to use with Miss T's wheelchair - Couldn't live without this feature! The HUGE volume of space inside the main compartment of the bag meaning that I can take so much more out and about with me - including things like popping my own cardigan in there and there's space for Miss T's precious Hoppy and Patch cuddly toys. The georgeous stunning 'Cream butterflies on Navy' print which seems to match any outfit and makes the bag far more than simply a changing bag. Yes Pink Lining should be extremely proud of this bag design. It really does tick all the boxes. It has a 'wow' factor. Miss T's reaction when she first saw it was adorable - She literally stopped in her tracks, gasped and said 'Mummy, I like your new bag' - Then she went up to it looking at it in awe and said 'It's got buff-lies (butterflies) on it'. The most common reaction from others admiring my new bag is utter amazement when I point out that it is technically a changing bag. How can something that looks SO good be a changing bag? That is Pink Lining's secret - All their bags look amazing with their unique prints and the Tote bags can easily pass as regular super-stylish bags but have the added bonus of being mega-useful as changing bags too. 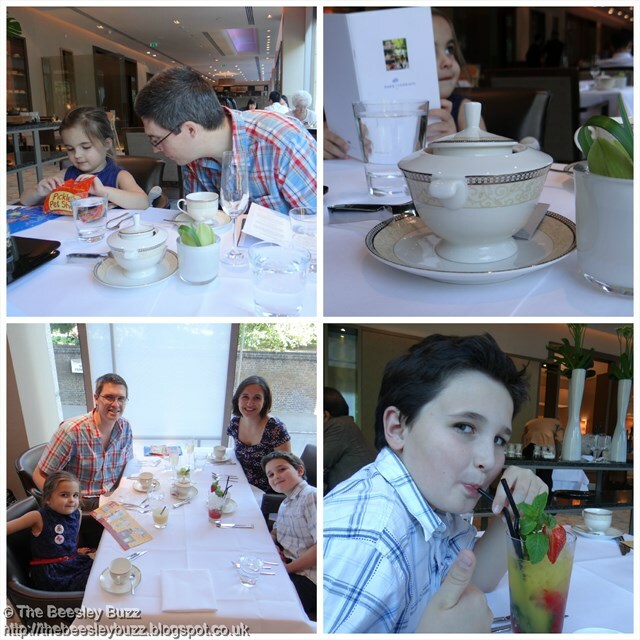 We headed off to London to really put the Henrietta through it's paces with Afternoon Tea at The Royal Garden Hotel in Kensington. 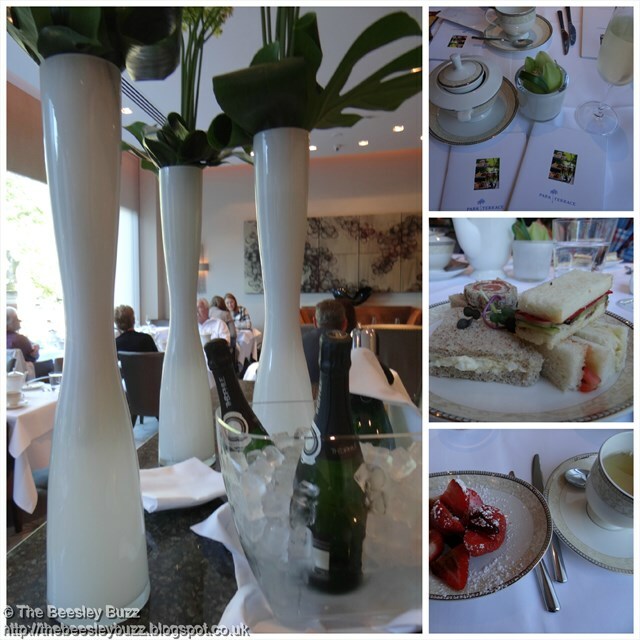 Afternoon tea is served in the Park Terrace restaurant. For somewhere oozing such high quality and luxury, they were extremely child-friendly. Whilst I sipped champagne, they rustled up a mocktail for D.
There was an entire menu of speciality teas to choose from. We were also served strawberries which were dusted in icing sugar with a drizzle of balsamic vinegar. Following our strawberries and champagne, came a plateful of sandwiches for each of us. Then the best bit, the cakes! There were warm scones with home-made apricot jam, strawberry jam and cream, a selection of tea cakes in the middle plate, and at the top were some gorgeous patisserie-style cakes. After all that cake, it was time for a stroll in Hyde Park right next door to the Royal Garden Hotel. Miss T had fun exploring and finding fallen leaves. The Henrietta Tote is a truly perfect bag from Pink Lining for the perfect day out. It is equally brilliant for popping to the local toddler group or for having a royal day out in London. It ticks all the boxes for the ideal changing bag when I'm with Miss T, and makes the ideal handbag for me when I am off out on my own. On the Pink Lining website it says about the Henrietta, 'you can sling it over your shoulder and look like a lady who lunches', or has afternoon tea it turns out. 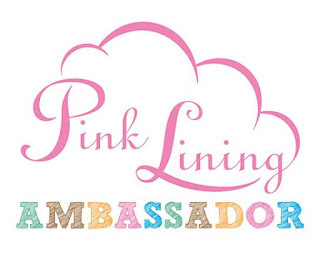 A very big thank you to Pink Lining for sending us the Henrietta Tote to review as Pink Lining Ambassadors. We'd also like to say a thank you to The Royal Garden Hotel for making our afternoon tea feel so welcoming and special. 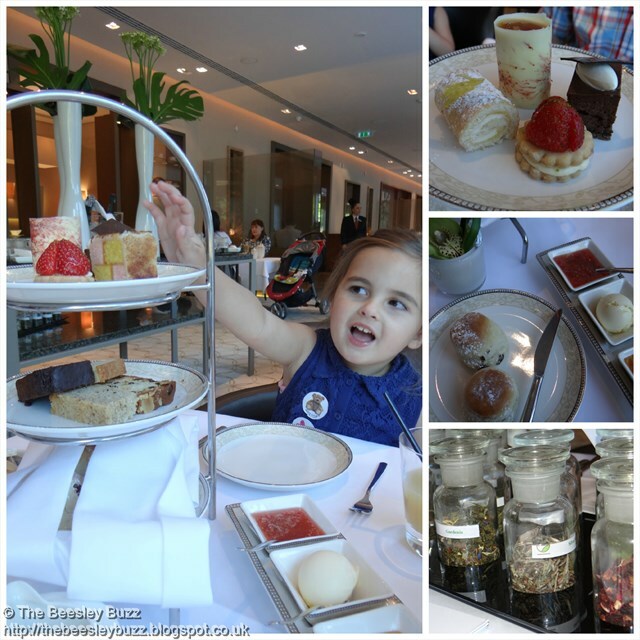 Our blog post about unique things to do in London was a runner up earlier in the year with the Tots100 and Royal Garden Hotel's blogger contest so we received a voucher towards the cost of our afternoon tea. So thank you RGH and Tots100 too! I know what its like to have a child who doesn't sleep. I really know what its like. When J was a baby, he dropped his daytime nap completely at 15 months old whilst all his playmates continued to nap for several hours in the afternoons for many more years. Nighttimes were no better as he would hop out of bed multiple times in the evening and then through the night if he woke up (he went from a cot to a bed early as he was such a climber it became dangerous to keep him in the cot as he could climb and fall out). We read the parenting books, tried all the advice and nothing seemed to work. Thankfully, our second child, D, was somewhat better. Although once the dummy went, so did the ease of falling asleep. Miss T, our third child who is now 3 years old (you'd think we'd have this sleep thing sussed by now wouldn't you? ), has been better still as she's a thumb sucker so we don't have the dummy problem. But at the moment, she still sleeps in a Gro-bag sleeping bag and is rapidly outgrowing it. Her cot is now transformed into 'cot-bed' rather than cot with bars and so I am dreading the day she no longer has the gro-bag and realises that she could hop out of bed herself. Her usual routine does include a book at bedtime anyway and so I was very intrigued to find out exactly how this book works. Written by behavioural scientist Carl-Johan Forssen Ehrlin who is also a Swedish teacher of communications, a life coach and a leadership trainer, what exactly were these techniques that have proved so successful to have made this book a Number 1 best-seller elsewhere? Reading the book, it soon becomes clear that the writing is very intentional and has been designed to help the child feel sleepy. With lots of actual yawning required and key parts to mention your child's name specifically. The book is easy to use as it is very straightforward which words you need to emphasize, which you need to read calmly and where to yawn and use your child's name. If it was posing as a regular story - it would be weird as some of the sentence structures don't work as a normal story. But as a type of guided relaxation, which I think is what the book tries to do, it does seem to work. Although she didn't fall asleep during the story (some children do apparently), her body language started to show signs of tiredness and she started to yawn too. One of the issues we had is that our normal storytime is an interactive time for chatting and bonding and so Miss T wanted to chat about the pictures, point things out and turn the pages herself. All those things kept her more alert and awake. I think with practice though, that may change. It may be that in future we have a more interactive story first where she can chat and get more involved and follow it up with this one as a calm story to relax to. This book seems to be aimed at children aged between 1 and 6 but my feeling is that toddler aged children may not fully 'get it'. Miss T got a little restless at one point as it is a longer story than she is used to and a child aged 1 or 2 may not really understand what it means to 'relax'. However, I think from age 4 or 5 upwards, it could prove to be a very useful tool. When 9 year old D was restless last night, I read him the whole book and before it had finished he HAD fallen asleep! I couldn't quite believe my eyes! The Rabbit Who Wants to Fall Asleep is available now in eBook and will be available in paperback and audio on 2nd October. The audio version will allow you to choose between a male and female narrator. Find out more and buy here. As part of the Mumsnet Blogger Network we were sent this book for the purposes of review. All opinions are our own. Mumsnet have put together a video where you can see how we and others got on with the #RabbitBook. This week's bakes were tricky weren't they? I couldn't see myself having anything other than a baking disaster with either puff or rough puff pastry for creme horns. The flavours in the Mokatines didn't appeal to me and I didn't fancy my chances of getting a religieuse a l'ancienne made of choux pastry eclairs to stand upright. But I don't want to quit baking along with bake off. So I'm going to stick with another, much simpler, creation made of choux pastry - profiteroles. I made these Raspberry Cream Profiteroles when raspberry season was in full swing and I had an abundance of mint growing in the garden. As is usual with my cooking decisions, I decided to make these to avoid ingredients going to waste; I had some cream to use up and whenever I have lots of eggs to use, profiteroles come to mind. Bearing in mind that I have regular baking disasters, you'll be surprised to hear that profiteroles are one thing that seem to be fool proof for me. So far they have turned out OK every time I've made them. I remember making them in the days before I owned any kind of icing bag and just spooning teaspoons of the mixture onto a baking tray seemed to work fine too. I doubt they were very neat but they still tasted ok. So these profiteroles follow a fairly standard profiterole recipe and are then filled with raspberry cream, drizzled with chocolate ganache and garnished with fresh mint leaves. I know we are now well and truly in autumn, but during the summer months these taste fresh and seasonal. 1. Preheat oven to 200C and grease baking trays a little butter. 2. Melt the butter in a pan on the hob with 175ml water and the salt. 3. Add the flour, remove from heat and beat well - The dough should look smooth. 4. Return to the heat for a short while. 5. Add the eggs one at a time - beat in well after each egg is added. 6. Pipe the dough onto the baking tray. Bake for 25-30 minutes. You can glaze the profiteroles with more egg mixed with a little salt brushed on before cooking if you wish but I didn't. Stir 150ml double cream into 100g of melted dark chocolate. Whip 300ml of double cream using a mixer (I used the whisk attachment on my Kenwood food processor). Then add in fresh raspberries and mix on a slow setting until the raspberries are gently crushed and mixed into the cream. To serve cut open the profiteroles and fill with raspberry cream. Drizzle with the ganache and serve with fresh mint leaves. One of my biggest weaknesses is a huge lack of confidence in myself (and especially my baking and cooking) so it was an amazing surprise to win last week's Bake With Bake Off challenge with Silver Mushroom with my Fesen-joon inspired pie and be featured on their blog and to get a Star Baker mention a few weeks ago at Mummy Mishaps with my Orange and Maple Polenta Cake. So perhaps I do need to have a little more confidence in myself. It's been a while since I did the last update on Miss T and her Juvenile Idiopathic Arthritis. I feel it is important to keep a record of her treatment and progress as she may have to face this with her own children or they may be others out there with a similar diagnosis who find it useful. We visited Great Ormond Street a few weeks ago as they had asked us to go back if there was still swelling in her left foot over the summer. They've decided to increase her weekly MTX injection dose to 12.5mg from the 10mg that she was on. They also wanted to do a steroid injection into her foot. This has come up locally at short notice so she is going into hospital next week to have it done. It's classed as an operation as they have to do it under general anasthetic and although there are some risks, they are hopeful that it will be successful. So it is hoped that the increased dose of MTX and the steroid injection will help reduce the swelling in that left foot and reduce the pain so that she can walk more and rely on her wheelchair less. 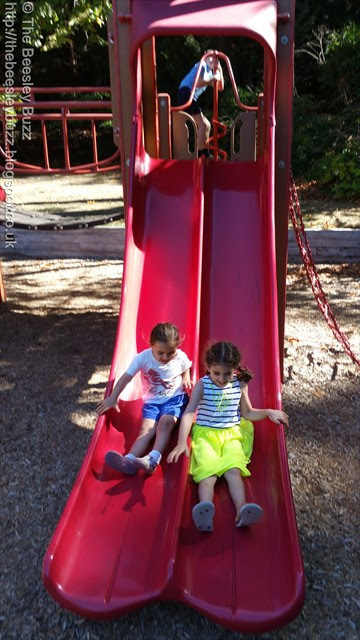 I am still so happy with how she is doing as to see her play with her friends and play at the park is just brilliant and a far cry from what I was able to do when I was first struck by Juvenile arthritis when I was 10. She has had a very 'full' holiday and although there were probably one or two things that we couldn't do because of her JIA, we did lots and lots of things that we wanted to do and having a wheelchair with us was not going to stop us. In addition to MTX she is still taking naproxen daily and needing omeprazole in conjunction with that, abidec and folic acid which is needed in conjunction with the MTX. She's still a very brave little thing and doesn't complain about her injections. We are using Metaject injections so they are brilliantly simple to use and it reduces the risks for her and means that we can administer them ourselves instead of the nurse coming out. All areas should be moving to Metaject rather than the old style syringes but as we found out recently there can sometimes be a bit of a battle to get the local healthcare teams to prescribe the correct licensed drug instead of it's inferior and higher risk counterpart. Thankfully it got resolved and the doctor has continued to prescribe the MTX in Metaject form for Miss T.
Blood tests are tough on her as they always seem to struggle to find her veins and her blood doesn't seem to flow very easily once they do. But she still doesn't complain even though we can tell it is painful for her. She is so fortunate to have had relatively few side effects from MTX. We just need to hope and pray that the higher dose combined with the steroid injection is sufficient for her to make enough progress to not need the next level of drugs which can have far worse side-effects. For the first time this year I had plenty of Siblings photos last month from our holiday to Canada. But as we didn't get back until 1st September and have been playing catch up since, I've only just had the chance to look through to find the pictures with all three of them in. So I'm linking this up with September Siblings as I can't imagine I'm going to find time to do a separate one for September. Shannon Falls - These two can be so close when they are not squabbling! Vancouver diary - Part 1 can be found here. Vancouver diary - Part 2 can be found here. Vancouver & Whistler diary - Part 3 is here. Celebrating 30 years of Super Mario with Super Mario Maker! The big three- o! 30 years old. Who would believe that Mario has reached the grand age of 30 already. It seems like yesterday that my brother was playing Super Mario Bros on the NES (Nintendo Entertainment System for those not as old as me) and then later the SNES (Super Nintendo Entertainment System) - gosh that's really showing my age! The tune would get stuck in our heads for days and the game was so easy to get into that me and my mum would sneak a go on it when my brother wasn't around. Now that famous Mario music is back again on a new game for the Wii U. A game that should have been invented sooner. It is a game that is so brilliant that I can't believe it wasn't invented sooner. Super Mario Maker for the Nintendo Wii U is a game featuring Mario and some other familiar characters where you get to BUILD your own games and then play them. I've loved seeing the boys work together on plans for the game and chatting about what to call the new levels they create. They discuss what is working well and what is proving impossible (D actually made a level he called the 'impossi-level'). They plan what changes to make. When we are expecting visitors, they even create levels with specific visitors in mind for them to play. Super Mario Maker is awesome. You get to create your own levels. You get new packs with new platforms, enemies and power-ups like an underwater pack and a castle pack. The castle pack has a Bowser that you can use in the levels you make. You can also play the '10 Mario challenge'. The '10 Mario challenge' is where you have to complete 10 pre-set levels with only 10 lives. Every level you complete gets added to the saved levels and you can play it again or edit it. You can add springs to your level and you can add wings to enemies. You can also stack enemies. I have also made a Labyrinth level where I have put down three Bowsers with wings and I have sub areas. A sub area is a pipe that Mario can go through to get to another area in the level. I have spiked balls and sound effects. I have put in doors that lead to another part of the level. There are pre-set bombs and I will also put in a Kamek. Kamek is a wizard. There are chain chomps and caterpillars and I have put in a Yoshi egg. Because it is in the castle you have to run to the axe to complete the level. I really enjoy it. 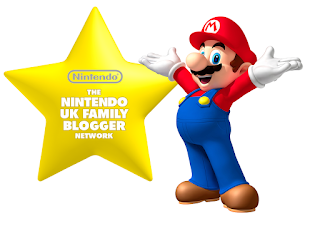 So you've heard it from our family's no.1 gamer 'Super Mario Maker is awesome'. We were also sent this special 30th anniversary edition Amiibo of Mario - How cool is that! Here's to the next 30 years Mario. Somehow I think you will keep looking better and better whilst the rest of us gets wrinkles and grey hair. Disclosure: As Nintendo Family Bloggers, we were sent a Mario 30th Anniversary Amiibo, a Mario flip book and a download code for the game for the purposes of review. All opinions are our own.